About 500,000 solar panels are installed each day worldwide. In China, two wind turbines are built every hour. Those statistics are laid out in a new International Energy Agency report cataloguing the rise of renewable energy, which is expected to be the source of about 28 percent of the world’s electricity by 2021 — up from 23 percent last year. The Te Apiti Wind Farm in New Zealand. More wind, solar and other renewable electricity generating capacity was built last year than coal — the first time in history that renewables have overtaken coal in new power plant additions worldwide, the agency said in its report, released Tuesday. About 70 percent of all investment in electric power generation worldwide flowed to renewables, totaling $288 billion last year. Those investments represent a 1.5 percent dip from 2014 because the cost of building solar farms and wind turbines is falling, the report says. “2015 was a record year for renewables,” said IEA renewable energy division chief Paolo Frankl, adding that 153 gigawatts of new renewable power generating capacity were built last year — about the same as all the power plants in Canada combined. 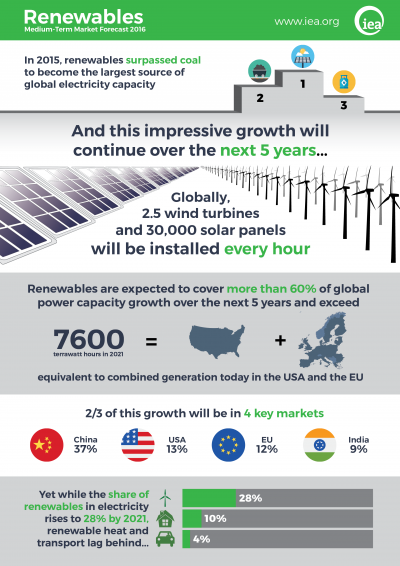 Global renewable electricity generating capacity is expected to grow 42 percent by 2021, according to the report. The agency previously expected renewables to grow about 36.5 percent during that time. Rapid growth in renewables is critical for countries to meet their emissions-cutting obligations under the Paris Climate Agreement, which aims to keep the globe from warming more than 2°C (3.6°F) over pre-industrial levels. Climate policies, such as the Clean Power Plan in the U.S., are expected to speed up the adoption of renewables worldwide as older coal-fired power plants are retired in favor of cleaner-burning natural gas and renewables, such as wind and solar. Continued rapid growth in renewables is also expected to be fueled partly by a sharp drop in costs. 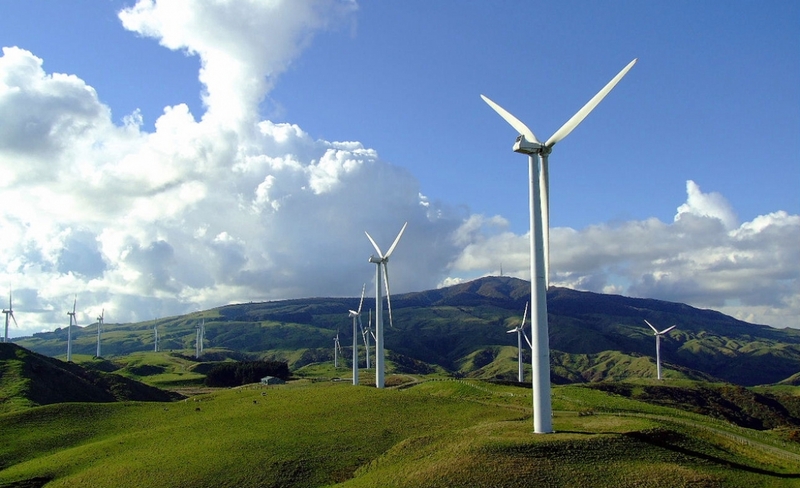 The cost of onshore wind turbines is expected to drop 15 percent between today and 2021, and the cost of solar photovoltaic panels is expected to fall 25 percent. A Bloomberg New Energy Finance analysis published Tuesday shows the drop in costs for renewables will also mean a drop in renewables investments even as the pace of solar and wind farm construction increases. But the analysis paints a less bullish picture for renewables investments after a sharp nine-month decline. Global clean energy investments in the third quarter of 2016 were down 43 percent from the same period last year. Investments are down overall partly because U.S. clean energy investments fell 19 percent in the first three quarters of 2016, the analysis shows. For renewables to grow rapidly as the IEA expects over the next five years, climate policies favoring wind, solar and other clean energy sources needs to stay in place so renewables can compete with the falling cost of fossil fuels, Frankl said. Most wind and solar growth is expected in China and the U.S., followed by Brazil, India, Japan and the European Union, where renewables-friendly policies are driving fast adoption of renewables. Renewables are expected to grow by about 60 percent in China over the next five years, in part because wind power helps the Chinese government shut down coal-fired power plants that are causing much of the country’s air pollution. “In Southeast Asia, growing electricity demand, increasing fossil fuel imports and air pollution concerns remain important drivers for renewable targets and policies, which are expected to bring increased diversification in the energy mix,” the report says.